Foreign casino operators have rushed into Macau over the past decade. Forget about Las Vegas and Atlantic City. Macau has cemented its status as the undisputed heavyweight champion of the gambling industry. The Chinese territory reported gambling revenue of 360 billion patacas ($45 billion) for 2013, an increase of almost 20% over the previous year. If that sounds like a lot of cash, it is. 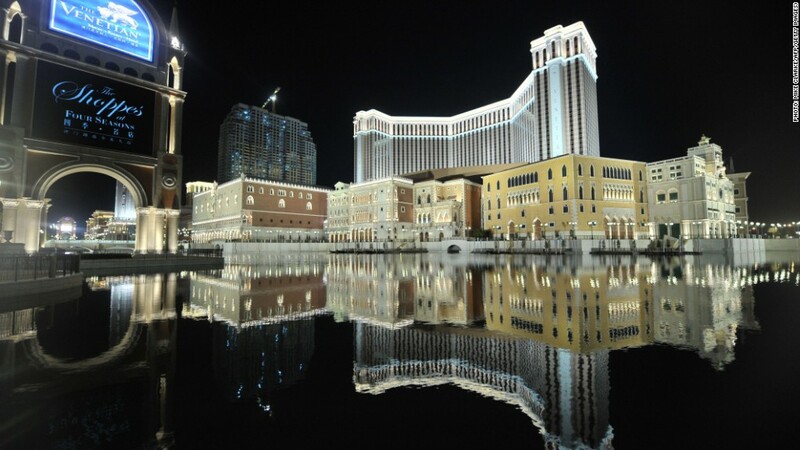 Las Vegas will be lucky to make $6.5 billion, or 15% of Macau's total. Atlantic City's haul is likely to be even lower. The former Portuguese outpost has been gaining momentum for years, fueled by a loosening of regulations and a Chinese populace that is eager to gamble. When restrictions on foreign operators were lifted in 2002, new casinos opened in droves as international firms joined the rush. Macau is the only location in China where gambling is legal, and millions of tourists flock to the territory each year. Rapid growth has attracted the biggest players in the industry, including Las Vegas Sands (LVS) and Wynn Resorts (WYNN). The boom has reverberated across the Pearl River Delta. In Hong Kong, home to some very devoted gamblers, the government is scrambling to build a bridge to Macau that will cross some of the world's busiest shipping lanes. Hong Kong gamblers currently rely on a fleet of ferries to reach the territory. Yet Macau, with a population just under 600,000, is not merely an imitation Vegas. Chinese gamblers favor games like baccarat over poker and blackjack. And Nevada still has the edge when it comes to entertainment, offering a greater variety of dining options and shows led by stars such as Britney Spears. Despite its runaway success, Macau's boom has not been without cost. The territory is almost entirely dependent on gambling. When the industry booms, tax revenue jumps and residents -- most of whom are employed in the business -- receive payouts from the government. As a result it's vulnerable to changes in policy and would suffer greatly if China repeated a 2008 clampdown on the number of mainland visitors. The city has also attracted unsavory elements often associated with the industry, including money launderers looking to evade limits on moving cash out of China. Beijing limits the amount of money Chinese can take out of the country to $50,000 per year. For those looking to skirt the rules, Macau provides an attractive option. By working with a junket operator -- which performs the basic functions of a tour company -- visitors use yuan to buy casino chips, but cash out their winnings in foreign currencies, including dollars. The money can then be moved abroad and used to make purchases in Europe and the United States. Despite efforts to restrict this activity, the practice has attracted plenty of criticism, including from the U.S. Congressional-Executive Commission on China.